A web site for people going through the divorce process. There is no easy part of getting divorced, especially if there is litigation involved. Unfortunately for me my divorce was very litigious. Few things gave me the feeling of dread more than walking into the courtroom… and the first time was the worst! Here are a few tips that may help take away some of the anxiety of going to court. It also never hurts to make a good impression on the judge and these guidelines make that much easier. Don’t be late. This seems pretty obvious, but seriously, arrive on time. It’s all about respect. Leave your attitude at home. Do not make faces or gestures when the judge or your spouse’s attorney is speaking. Judges see this and do not appreciate it. Dress appropriately. I’m sure you’ve heard the expression “You can’t judge a book by its cover”. Unfortunately some judges just might. Why take the chance. Men should wear slacks, a jacket and a tie. Women should wear a skirt or dress slacks and a modest blouse. There is no place in the court room for jeans, shorts, revealing clothes or flip flops. If you aren’t sure how to dress consult your attorney on how he/she wants you to dress. If you have an attorney do not speak unless asked to do so by the Judge. “Your Honor” is the appropriate way to address the Judge. Always thank the Judge when you are finished speaking. Again, it’s all about respect. Only speak when you are spoken to. Never speak to or make comments to your opposition when you are before the Judge. If you need to communicate with your divorce attorney write it on a notepad. 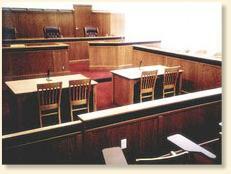 This entry was posted in Divorce and tagged courtroom behavior, Divorce, divorce court. Bookmark the permalink.